Sign the Kids up for Swim Lessons before the Summer Heat Hits Pinellas County! Can you feel the heat and humidity in the air already? Are your kids already begging to jump in the pool or go to the beach after school every day? Well, if your kids (or you yourself) needs to learn to swim before the heat gets unbearable there are seven places to get swimming lessons in Pinellas County this spring! At the YMCA they emphasize being a strong and confident swimmer by the end of your lessons. Your little ones will learn to acquire safety and rescue skills and experience water activities they will be able to enjoy forever. They offer both group swim lessons and private lessons depending on what works best for the swimmer. The ages groups: Parent and Child, Preschool, School Age and Teen/Adult. Private lessons are for those that need more one-on-one attention in the water. An instructor will work with you or your children to specifically cater to your needs, whether you’re looking to get over a fear of water or want to learn to be a faster swimmer, private lessons will be perfect for you. You can also sign up for semi-private classes that are designed for couples or friends who want to learn to swim together. The Clearwater YMCA has weekday lessons from $42-$84 and Saturday lessons for $32-$64, depending on if you are a facilities member or a program member. They have 5 month long sessions going on before summer ends, but be sure to sign your kids up before all the spots are taken! The YMCA Highpoint has two spring sessions and six summer sessions. Their swim lessons are either on Tuesday and Thursday nights starting at 5 pm or Saturday mornings starting at 10:30 am. At the Highpoint YMCA a swim test is mandatory and they only have lessons for infants and kids, not teens or adults. The St. Petersburg Parks and Recreation Department wants to keep your kids safe this summer. With classes for all ages (ages 6 months and above), they are teaching both young kids and full grown adults how to get comfortable and confident in the water. Each class session costs $39 and they consist of 40 minutes with a swim instructor for your kids Monday through Thursday for two weeks. The lessons start at beginner and go all the way to the top to advanced lessons but the levels offered at each pool varies. All of the instructors have been certified by the American Red Cross and taught by the Water Safety Instructors. There are five sessions being held throughout the summer. Below are the different times and dates for each pool, but we all know that there’s no better way to beat the heat than a jump in the ocean or dip in the pool so be sure to sign up for these classes before they’re filled! The East Bay Regional Park District is investing in your safety while enjoying their parks this spring and summer. 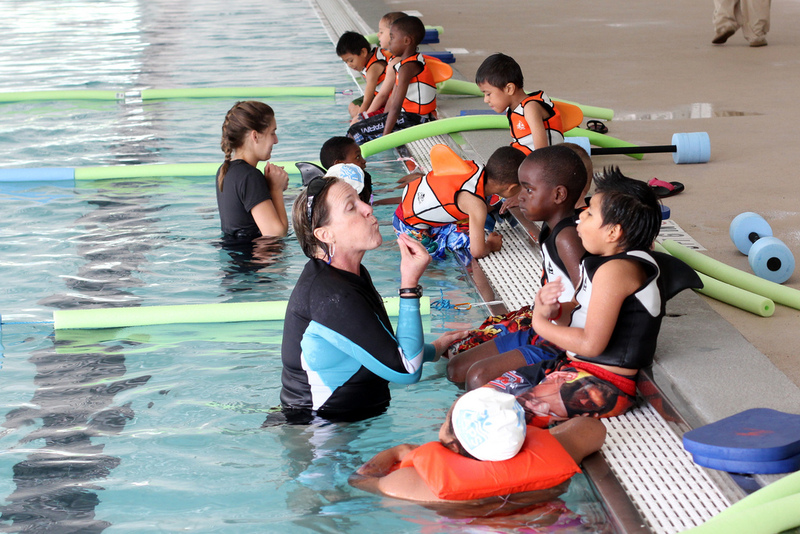 They are offering swim lessons at two locations, the Roberts Pool and Contra Loma Swim Lagoon. They have five different kinds of swim lessons: Parent Tot, Supertot, Learn to Swim, Adaptive Swim Lessons and Private/Semi-Private Swim Lessons. Parent Tot classes are for tadpoles ages 6 months- 3 years of age to learn how to get comfortable in the water at such a young age. Parents will help adapt their children to the swim lesson atmosphere while assisting the instructors in teaching their kids how to float, support themselves with kicking and blow bubbles in the water. The SuperTot classes focus on children ages 3-5. It teaches them to engage in independent skills such as unsupported floating, gliding, unsupported kicking, and water entry/exit. Learn to Swim classes, for children ages 5-13, focuses on teaching your little swimmers everything they need to know about the water in six different levels. From level 1-6 the introduction to water skills, fundamental aquatic skills, stoke development, stroke improvement, stroke refinement and swimming and skill proficiency. Adaptive swim lessons are for kids with disabilities and private/semi-private lessons are just one-on-one or with our child and a friend or sibling. The Roberts Pool has five sessions throughout the summer with lessons taking place throughout the week. Contra Loma has four sessions with morning and evening classes taking place throughout the week. Classes cost anywhere from $55/session to $125/session depending on what your child needs. But make sure to sign our kids up before they’re the only little swimmer unable to ride the waves at the beach! So whether your kid has a fear of the water or they're eager to learn to swim, there are options on here for everyone! Be sure to sign up soon as swim classes often fill before summer begins. For more information on things to do for your family this summer log on, and be sure to register with 727area your free guide to everything in St. Pete and Clearwater.